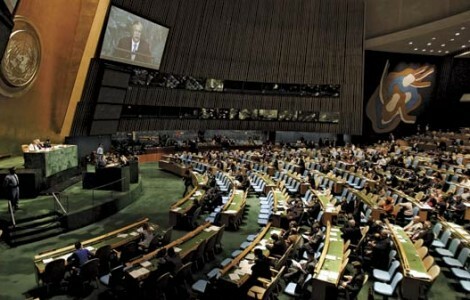 As reported in Wawatay News, Canada has endorsed the United Nations Declaration on the Rights of Indigenous Peoples (UNDRIP) “in a manner, it says, is consistent with Canada’s Constitution and laws.” Although non-binding, the 46-article Declaration is nonetheless held up as a significant and meaningful standard by which to judge Canada’s treatment of, and conduct toward, Indigenous peoples within its borders. Ya gotta love her timing, eh? For certain ‘you gotta love her timing’. She’s raising, but one of a plethora of issues that need to be addressed. The declaration is simply a starting point; any country that thinks they can endorse the declaration and then leave it at that has no clue as to what it’s all about! Shawn Atleo of the AFN issued a news release applauding Canada’s endorsement. Why – I have no idea. The Harper government doesn’t respect Indigenous rights in Canada, does everything it can to undermine Indigenous rights, and has no intention of respecting the UN’s Declaration on the Rights of Indigenous Peoples. It’s a qualified endorsement that should be condemned for the wishy-washy, push-me-pull-you kind of BS that is the hallmark of this Reform-Alliance-Con job called the federal government. Do I should bitter? Hope not. P-O’d is how I feel. Really P-O’d. Yer absolutely right. Go MacIvor! This so called endorsement is much like the so called “Apology”. It is a PR move, not meant to change policy at all in any way that is really to the benefit of anyone except probably those interested in privatization. If Canada were to actually implement this document a lot of things wouldn’t stand. Just wait until we see if the Feds move on providing water to Northern reserves, who wants to bet it will be by a private company? All of these forced policies are arguably in contradicition of the declaration, not to mention the basis of Federal sovereignty. Canada cannot like most states actually live up to this agreement. gender discrimination. I find it difficult to reconcile the inconsolable cultural genocide that Indigenous women have been subject to within settler-colonialism. I applaud McIvor’s tenancity and her stand for social justice. I agree the Conservatives have no clue!